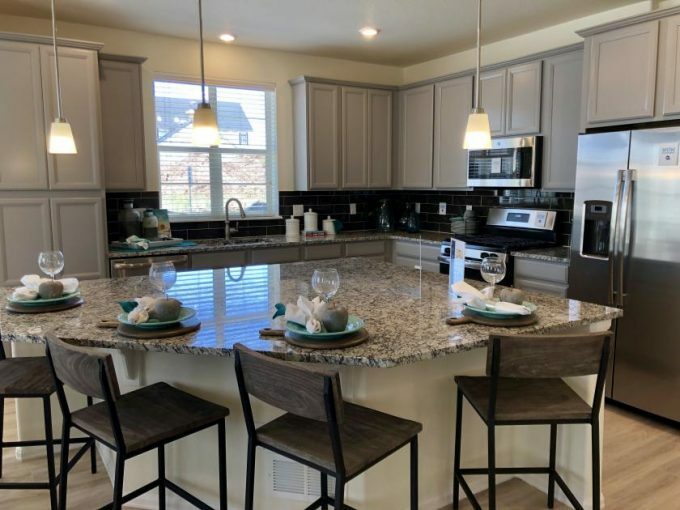 Shopping for a new home at Sterling Ranch in Littleton? The Elements Collection by Lennar at Sterling Ranch gives homebuyers the opportunity buy a new home in Sterling Ranch for under $500k. Before the Elements collection came along it was pretty much impossible to buy a new home in Sterling Ranch for under $600k. But the Elements collection, with base prices in the mid to high 400’s, offers homebuyers a more affordable option in Sterling Ranch. Plus these homes come standard with such things as window blinds, air conditioning and full landscaping. So many people move into their new built homes and still have to spend more on landscaping projects and window coverings. With all the inclusions in these homes homebuyers can move in at not much more than the base price. I also want to mention that these Lennar homes come standard with a full kitchen appliance package. Most builders do not include a refrigerator. The only thing that I can think of that a homebuyer would need to buy when moving in is a washer and dryer. I do want to mention that these homes do not have basements. They are built with concrete crawl spaces. I’m sure this is where some of the money savings comes into play. But I know for many of you a home without a basement is a deal breaker. These homes also have shared driveways. And each home has an attached 2 car garage. Homebuyers have their choice of five floor plans in the Elements collection at Sterling Ranch. There are three models onsite to tour. Be sure to watch the videos below for full walking tours of the model homes. To see these homes in person or for help in finding your new home in Littleton contact Courtney Murphy. Courtney is a Denver metro Realtor serving Littleton, Sterling Ranch and beyond.